Hello everyone! 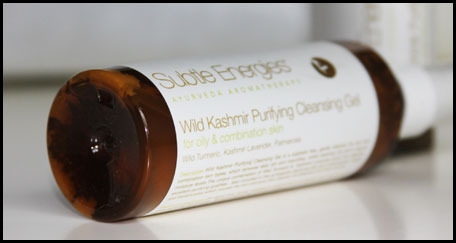 I'm really excited to bring you this review today - it is a brand that is completely new to me, and I'm sharing my thoughts on their Wild Kashmir Purifying Toner and Cleansing Gel today. 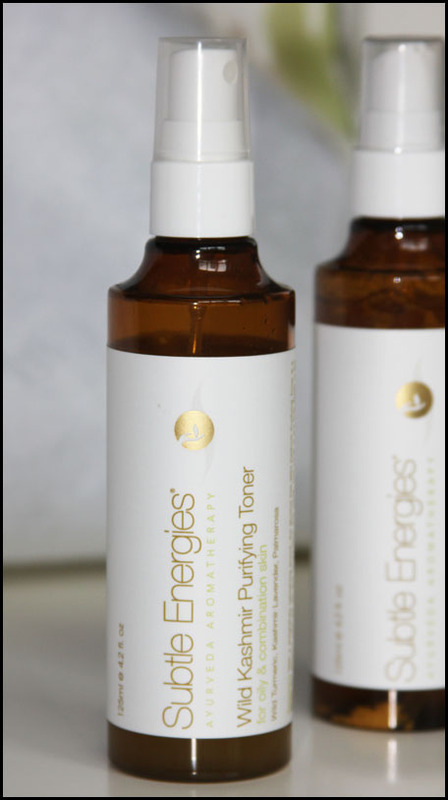 Subtle Energies started in 1993 and is based on the knowledge, experiences and research of Farida Irani. Farida has been internationally recognised for being a pioneer in Ayurveda Aromatherapy and in reviving this ancient aromatic branch of Ayurveda (the Ancient Indian science of medicine, which literally means "Science of Life"), long forgotten by many practising Ayurveda today. Of course, I have to comment on the smell of these products. The cleansing gel smelt very strongly of tumeric (at least it did to me), and had a subtle lavender scent as well, which I loved! I should probably have stated from the start that I am a huge fan of aromatherapy. My Mom is big on spas and smells and oils, and I guess that rubbed off a lot on me. These smells were very much more Indian compared to what I'm used to, which is expected, given the origins of the brand. As far as performance goes, this facial wash didn't do much for me. In my opinion, only people well healthy enough skin will be able to use this without issue. I found this too mild for my skin, and I felt as if the impurities on my skin weren't being thoroughly removed at the end of the day. Another problem I faced with this cleansing gel was the pump. You might notice in the picture below, that the cleansing gel isn't purely gel. There are what looks to me like crystallized grains suspended within the gel. I'm not sure what they are - the product info doesn't say anything about it. Maybe they're meant to exfoliate? I don't know. After about two weeks of use, I gave up on using this completely. After the first week, the grains inside the cleanser jammed the pump mechanism, so nothing was coming out no matter how hard I pumped. I took to turning the bottle upside down so the pump wouldn't jam, but that got tiring because the bottle kept falling over. Keeping it laying down didn't help un-jam the pump, so I gave up. This cleansing gel retails at AUD 36.90 for a 125ml bottle. This toner comes in a spray bottle, which I find extremely convenient. It smells the way I imagine an Indian spice market would smell like - very exotic and complex. We have a Little India back home in the town where I grew up, and this is exactly what it smelt like when I used to go there to buy costumes for our school concerts and bangles, just because I love their bangles. The smell only lingers for a couple of seconds, for those of you who are sensitive to fragrances. Like the cleanser, there are particles suspended within the toner, but unlike the cleanser, these are very fine, and don't affect the spray mechanism in any way. It does settle at the bottom of the bottle though, so you have to shake it well before misting it onto your face. 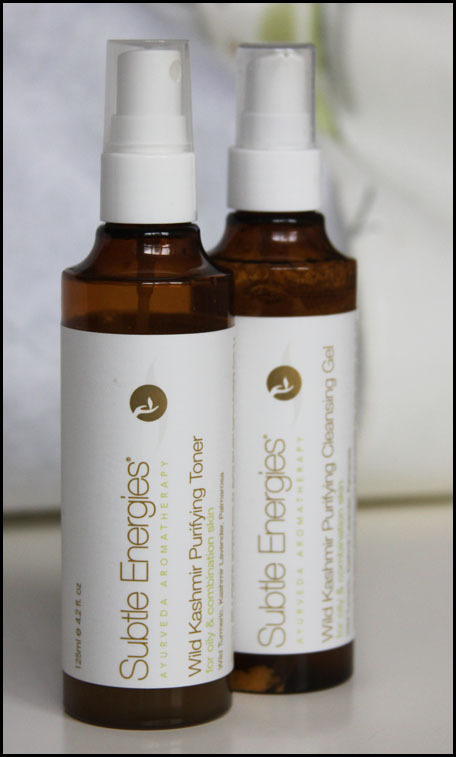 I have taken to using this toner every morning now - it is a great way to relax and refresh at the same time in the early morning. Not to mention I don't have to do so much work finding my cotton pads and fumbling with the bottle cap whilst trying to pour toner out onto the cotton pad. Always a plus when you're bleary eyed and not so bright in the mornings. I really like this toner. It is convenient, it helps my moisturizer absorb just a little bit faster, its smell is so calming, and it's been doing my skin good so far! This toner retails for AUD 37.40 for a 125ml bottle. Adore Beauty currently sells the Wild Kashmir range (including a moisturizing emulsion) for AUD 126.50, just for anyone who might be interested in purchasing this range.